Discover how easy having GREAT HEALTH can be! 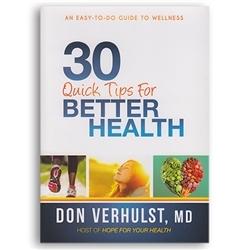 These thirty practical steps will help you build new habits throughout the month or simply now and then, whenever you have the time or need a simple health solution. Today is a new day! Take one step toward better health by reading just one of these thirty quick tips. You will find yourself on the path to a happier, healthier tomorrow. God's Creative Power For Finances - Charles & Annette Capps (Paperback) Dear Rabbi & Susan - 101 Real Life "Ask the Rabbi" Questions – Rabbi Daniel and Susan Lapin (Paperback) Miracles in American History: 32 Amazing Stories of Answered Prayer - Susie Federer (Paperback) Where’s My Answer?